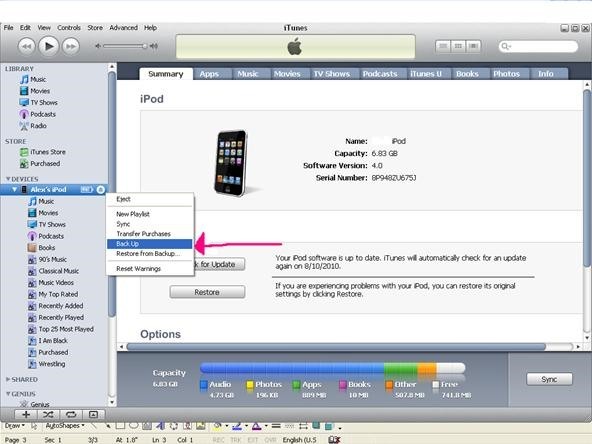 How To: Jailbreak ANY iPod Touch, iPhone, or iPad on ANY Firmware! 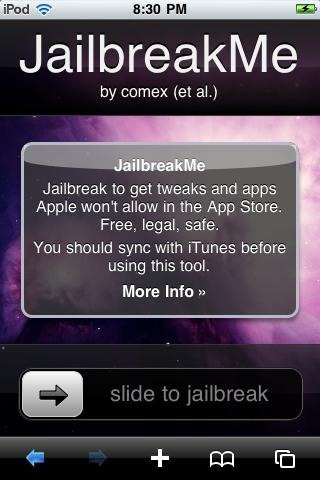 www.jailbreakme.com has recently created a new way to Jailbreak any iPod Touch, iPhone, or iPad, regardless of the firmware it is running. It is EXTREMELY easy! If you were thinking about Jailbreaking, but were afraid you did not have the technical abilities to do so, now you can! When someone says that their iPod, iPhone, or iPad is "jailbroken," they mean that they have installed Cydia, a third-party app store. Why Jailbreak? Why not just stick with the original App Store? Custom battery logos, slidebars, etc. 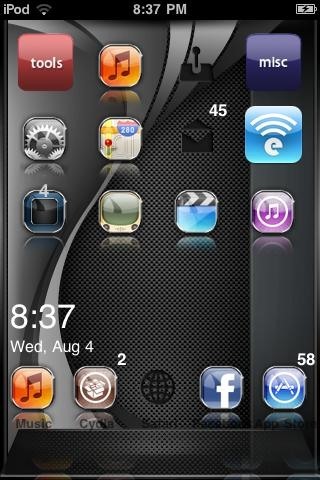 This is an example of a Jailbroken iPod Touch with a custom theme. Notice the customized icons, folders, background, 5-icon dock, and the customized clock in the lower left. YES! Jailbreaking is totally safe and reversible. If at anytime you wish to return to the original Apple software, all you have to do is restore your device. Step 1 Backup your device. Open iTunes and connect your device. Under "Library" on the left-hand side of iTunes, a "Devices" section will appear. Simply right click on your device and select Backup. When it is finished, unplug your device. Step 2 Open Safari on the device you are going to Jailbreak. Step 3 Slide to Jailbreak! Once at Jailbreakme.com, there will be a slidebar towards the bottom that says "Slide to Jailbreak!" Slide your finger across it. Your device is now downloading and installing Cydia. This will takes several minutes. Step 5 Open Cydia and go to work! Once Cydia has been installed, open it up and start customizing! Most of the customizations require a Cydia app called Winterboard. I reccomend that you download it before you download any of the customizations. You open Winterboard, select the customizations you wish to apply, then let it respring. When it is done, you will have successfully applied your customizations.